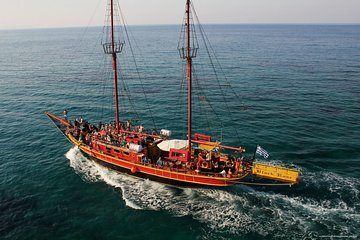 Great Pirates = fantastic Crew — worse to book! I definitvly DONT understand some of the google ratings about Food or overfilling.Our Trip started in Time, everything well Organized, BBQ (Steak, Salat, Tzaziki) at the boat. Super Fair bevarage prices ( Beer 2,50€, Coke 2,00€).Nothing could be done better! Excellent day out and fun, well worth doing and the pirates are very funny, great experience. 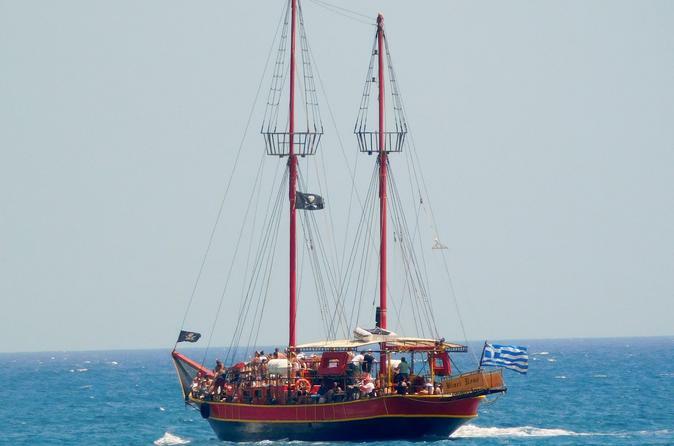 We pre-booked this trip online through Viator before we arrived in Crete and so glad that we did, from the moment we got on board the ship to the moment we left we had a great time, the guys pirates on board are lot's of fun, great with the kids and adults alike, the ship itself certainly attracts the attention of everyone else as the music starts up with a fanfare of drums and base to let everyone know something special is departing the port, adequate seating and a short trip to a small bay for a refreshing swim was entertaining, then it's a great voyage across the hersonissos bay to the small village of Sissi where you can spend some time shopping or in the cafe's and bars. We would definitely do this trip again. Excellent . A lot of fun. Highly recommended.